You all think that just the four of moved into this house, and some of you are right. However, we have a friend that lives here too. She doesn't live in the house though, she lives outside. She was here when we moved in and we are welcome that she has stayed. 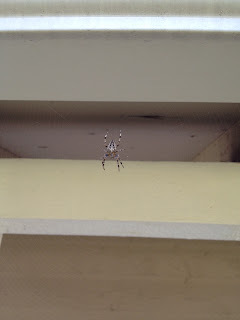 We aren't sure what kind of spider she is, or even if she is infact a girl, but we have been intrigued by here nonetheless. In the past three weeks, she has moved her web to six different places. She has repaired two webs. It is magic watching her spin her web. It's neat just watching her there. I am terrified that she is a deadly spider and that one of these days when I am watching her she will come down and attack me, but in the mean time, it's just fun to watch. So here she is, Charlotte, named after the book/movie. Make sure to click on the picture though because enlarged, she is even prettier.